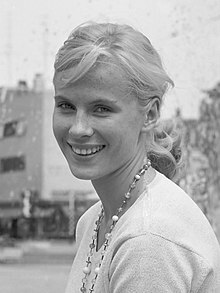 Andersson's intense portrayal of a nurse in the film Persona (1966), in which the actress Elizabet Vogler (Liv Ullmann) is mostly mute suffering from a psychosomatic condition, meant that she delivered the majority of the dialogue. For her performance in Persona, she won the award for Best Actress at the 4th Guldbagge Awards. That year alongside James Garner and Sidney Poitier in the western Duel at Diablo. More Bergman collaborations followed, and she worked with John Huston (The Kremlin Letter, 1970) and Robert Altman (Quintet, 1979, with Paul Newman). She was actor Steve McQueen's co-star in his only cred film as a producer, the film of Arthur Miller's stage adaptation of Henrik Ibsen's An Enemy of the People (1977).